After chatting with lots of folks at the Wine Country Ukulele Festival, we came away with good information about what people are looking for in ukuleles and we went right to the workshop. We’re building up several new Keystone tenors and a couple of concerts to start. Visually, people tended toward the dramatic woods, it’s only natural. I mean, quilted Maple is crazy beautiful stuff, but when it came to sound they seemed to gravitate toward the Keystone ukuleles with the less dense soundboards… cedar and Kauri. It seems the softer woods make a big full sound that people immediately reacted to. This is good in many ways actually. First, the less dense woods tend to be faster growing trees so they are much more sustainable and consequently, less expensive and more readily available. Good for you and good for the Earth. They also tend to be easier to work with generally (although, more difficult in some ways too, particularly sanding). We also like the very simple look of the softer woods. As you may have noticed our Keystones tend to have a very plain look. We also came away with several ideas about how to get a mellower voice out of very dense woods. We’re experimenting right now with a Keystone concert with a micro-thin Padauk soundboard. It is going to require some modifications to the bracing but we’re hoping to get a lot of volume from a concert. Our semi-hollow HardBodys were very well received. There is something very special about the tone they make. It’s indescribable. Fuller? Deeper? More nuanced? I don’t know. It’s hard to describe the difference in tone, but the sustain is other-worldly. You also ‘feel’ the instrument much more through your body. It’s a very different experience. 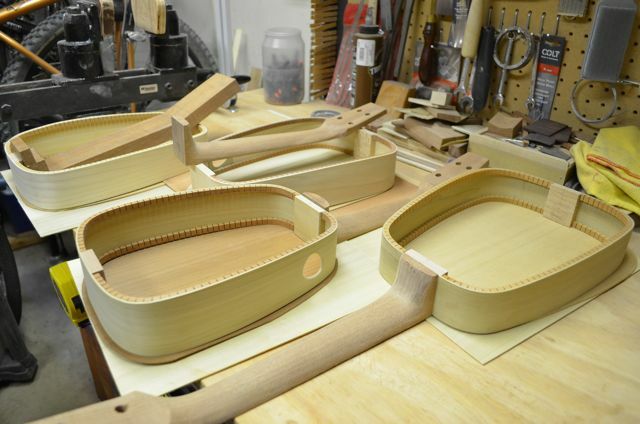 The issue with the semi-hollow construction is that is very labor-intensive. We love going to shows because the feedback is invaluable, but now my head is just full of new ideas to try and ukuleles to build.